I hired this company and I am so pleased of the work. Stephen Guidry and his family are so kind, helpful, and provided wonderful work. If I ever needed to build a house again I would hire them again in a heartbeat!! Building a house is stressful but they helped me through the whole process and the end results are exactly what I envisioned!!! 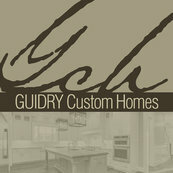 Stephen Guidry is honest and fair priced compared to all the other contractors I spoke too. My family is so happy in our new home.